At a time when his contemporaries were painting murals on nationalist and overtly political themes, Rufino Tamayo chose to paint intimate canvases of a more subtle and lyrical nature. His initial preoccupation was with learning the lessons of the artists he most admired: Cezanne, Matisse, and Braque. Concurrently, he discovered Mexico's wonderful plastic traditions, best exemplified in the pre-Columbian art of his ancestors. It is in Tamayo's ability to fuse the most sophisticated aspects of Modernism with the expressive power of the ancient arts of Mexico, that his particular genius lies. By 1931, after a decade of assimilating modern European painting to his own highly personal style, Tamayo had developed heavy, hierarchical figures, clearly inspired by pre-Columbian art. These alternated with still-lifes, paintings of the indigenous people, and culminated in 1938 with a series of early masterpieces on the theme of Women of Tehuantepec. The influence of Picasso resulted in greater distortion in Tamayo's paintings of the early 1940's. He was drawn to the expressive violence of Picasso's forms, their relationship to both pre-Columbian art and the savagery of the historical moment. The theme of aerial bombardment, first suggested in the Guernica, became a major theme of Tamayo's throughout the 1940's. Tamayo's awareness of mankind's ever-growing capacity for self-destruction gave rise to paintings of the early 1950's with titles such as Cosmic Terror and Burning Man. He developed a unique hybrid of what might be called broken glass cubism: shard-like compositions which arc and slice through space. With his poet's eye he saw the relationship between jagged pieces of glass and flames of fire: tortuous, transparent, the remnants of catastrophe. Images of the night sky, of lone men or lovers contemplating the heavens, were, from the beginning of his career, an important motif in Tamayo's paintings. To this primordial imagery, steeped in the devout gaze of primitive man, Tamayo in the 1950's added the specter of modern technology: rockets, supersonic airplanes, and spaceships, subject matter fitting for the decade of our first explorations of outer space. The fascination with movement, apparent in Tamayo's paintings of space travel, subsided by the late 1950's. From this time forward, line played a lesser role, and Tamayo painted the solitary, monumental, figures which we associate with his mature style. Increasingly color and painterly richness became the dominant expressive forces in his paintings, a tendency which would prevail over the course of the next three decades. Tamayo said that subject matter was a pretext for making paintings. He wanted to remind the viewer that the physical reality of painting, the tactile and retinal reality, was his first subject. This fidelity to materials was a lesson he learned from pre-Columbian art. For Tamayo, no matter how exalted the subject, painting existed first as a physical, sensuous experience. However, his sensuality was tempered by sobriety and discipline. Tamayo was rigorous in asserting the two dimensional properties of the painted surface. He was equally rigorous in limiting his palette to as few colors as possible. He had a remarkable ability to evoke the textures and colors of nature: of stone, metal, wood, flowers and sunsets, terra-cotta vessels and the earth in which they are entombed. Yet, Tamayo's sensitivity to the physical world tells us only part of the story of his artistic achievement. From the beginning of his career Tamayo painted still-lifes in which the watermelon was a recurring image. Surely, Tamayo's love of watermelon derived from his experience as a young boy working in the fruit markets of Mexico City. What could be a more potent image of the everyday pleasures of this world, than this luscious fruit of brilliant color, and sweet, juicy flavor? Although the shape of the halved watermelon can be seen as a smile, and was often used by Tamayo to form the mouths of his smiling figures, watermelon has much deeper resonance. This fruit is cut with a knife. Even the shape, the angular slice of melon suggests the process of cutting. The fruit itself is flesh-like, its color sanguine. Watermelon, which symbolizes the sensuousness of the mundane world, is, in Tamayo's painting, also an image of ritual sacrifice, an offering to the unknown forces which shape our universe. And there is yet another level on which this form vibrates with meaning: Tamayo, by accentuating the crescent form of the watermelon, ties it to the phases of the moon. In so doing he creates a poetic image which simultaneously evokes the sensuousness of the fruit, the ritual of blood sacrifice, and the moon's timeless presence. In the above quotation, Tamayo speaks of the complexity of the Mexican psyche, and the contradictory feelings which are at the heart of his own artistic temperament. Tamayo's paintings have a bone-like austerity of construction. His figures are pared and reduced to their utmost simplicity. Their inner armature of skulls, rib-cages, and hip-bones is exposed. However, these figures also have articulated limbs, which we associate with marionettes and toys. They smile and gesticulate with the spontaneity of children. Tamayo's figures, or personages as he called them, are simultaneously images of mortality and talismans of child-like exuberance and wonder. To the extent that his paintings evoke the ancient pre-Columbian past, cultures which no longer exist, Tamayo is also evoking the transitory nature of civilization. Tamayo's imagery can seldom be identified as belonging to a specific Meso-American culture or historical epoch. His otherworldly figures are at once ancient and futuristic, and as such stand outside of time. Tamayo's personages often appear as dehumanized robots, painted on ancient walls. This last effect is reinforced by an incised, painted surface which seems earthen, stone-like, and is in fact a mixture of delicate washes of paint combined with granulated marble dust. His textures serve the twin purpose of suggesting both petroglyphs and the irreducible substances of the terrestrial world. In attempting to distinguish Tamayo's achievement from that of the Muralists, writers have focused on his concern for aesthetic values. In so doing they have often overlooked Tamayo's gifts as an image maker. Yet, it is impossible to think of Tamayo's paintings without remembering his howling dogs, attacking birds, star-gazers, and astounding array of madmen, clowns, and eccentrics. Tamayo knew the power of the spontaneous gesture, the unnerving laugh or cry, and many of his most memorable paintings include images of such expressive outbursts. Tamayo lived until the age of ninety-one, and painted with intensity and rigor until the very end. His late works are suffused with a mood of optimism, which is confirmed by their rich, painterly substance, and serene sense of detachment. The iconography of these paintings often includes figures which are without eyes and mouths, as if the passage of time had worn away their features. Like the pre-Columbian art of ancient Mexico, these paintings have a powerful physical presence, and yet remain remote, inhabiting a world of "almost mineral silence"3. Whether painting in the shadow of Muralism, Abstract Expressionism, or Pop Art, Tamayo remains a unique and solitary artist. His true contemporaries are Bacon, Dubuffet, and Balthus, artists who pursued figuration at a time when American Abstract Expressionism was in ascendance. Among North American artists, de Kooning shares significant affinities with Tamayo: both possessed a violent expressionism, both savaged the human figure, and both were fascinated, indeed obsessed, with the female form. 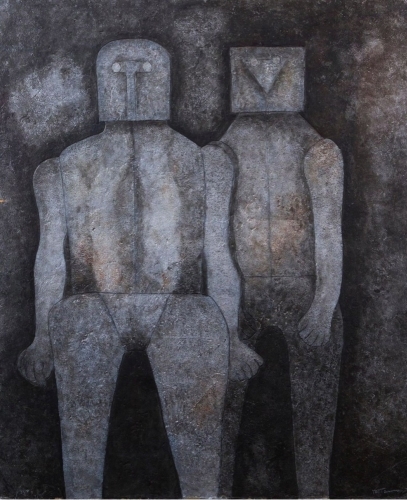 Today, there is growing recognition of Rufino Tamayo's formidable talents. In addition to being a major figurative artist, who created a personal synthesis of the ancestral and the modern, Tamayo is, along with Matisse, Bonnard and Rothko, a supremely gifted colorist who expanded painting's formal language. His innovations with the surface of the canvas are, along with those of Dubuffet and Tapies, among the most varied of any painter working during the last half of the Twentieth Century. Apart from these achievements, there is a visionary quality: contemplative, evocative of the eternal, of ancient architecture and of the stars and planets, which is Tamayo's unique contribution to the poetics of Modernism. Ultimately, Rufino Tamayo's historical placement is far less important than his remarkable body of work, which promises to outlive us all. Paz, Octavio, Essays on Mexican Art, Harcourt Brace and Company 1993, page 236. Colle, Marie-Pierre, Latin American Artists in Their Studios, Vendome Press, 1994, page 188. Paz, Octavio, Tamayo: Geometry and Transfiguration, from the book Rufino Tamayo, Octavio Paz/Jacques Lassaigne, Ediciones Poligrafa, S.A., 1995, page 13.